If you think today's college students have it easy, consider the plight of a Xavier University undergrad heading to lunch in the sprawling dining hall. Does she opt for a made-to-order omelet or a customized wood-fired pizza? What about a Philly cheese steak from the grill? Or a nice Bolognese from the pasta station? These are the decisions that can try a student's soul. "We've kind of stepped it up a bit," said Ed Devoid, Xavier's senior director of dining services. He started in the business in 1972 in a college cafeteria that offered two entrees and side dishes. Students at residential campuses throughout the country have much higher expectations than their parents did about creature comforts like air conditioning, private showers and an array of food options to rival a cruise ship, and universities are investing in big upgrades to keep up. 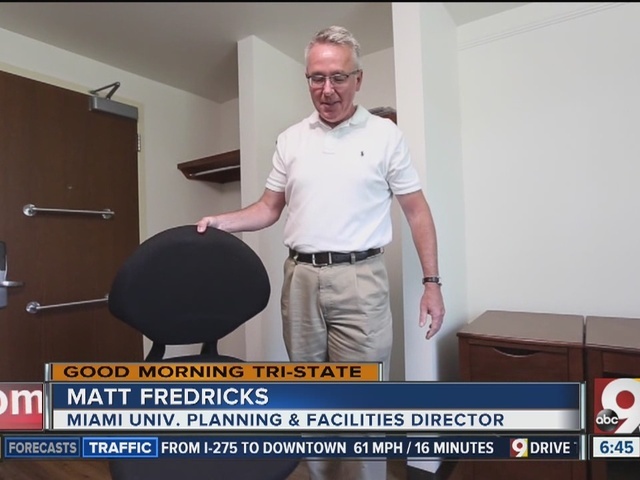 Renovated rooms in Miami residence halls feature smart thermostats with air conditioning and amenities like desk chairs that convert to gaming chairs and laptop stands. Photo by Emily Maxwell | WCPO. XU is no exception. 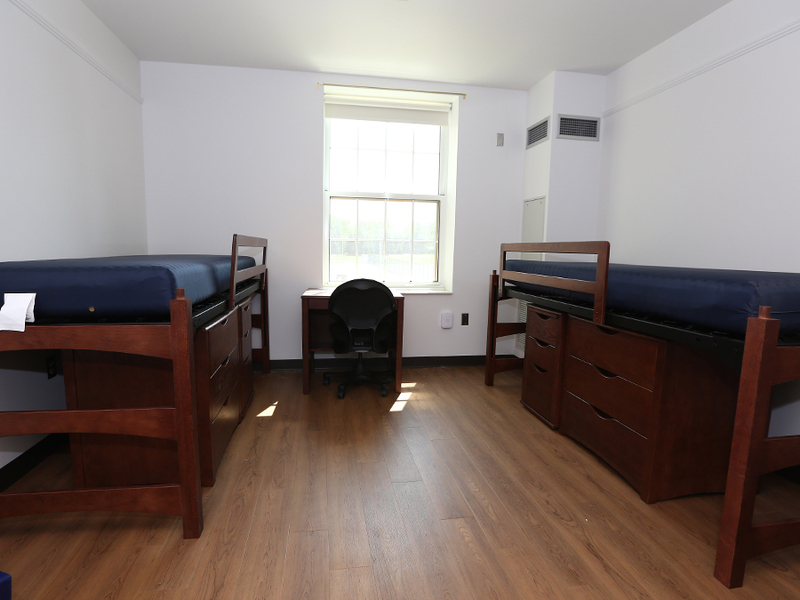 In Fenwick Hall, which opened about six years ago, six-student suites include four bedrooms, two bathrooms with showers, an expansive common room, a sitting area and touches like a linen closet. Once a week, XU staff clean the restrooms. "It's just an expectation now. You go anywhere now you're going to see similar options," said Lori Lambert, senior director for student affairs. One of four bedrooms in a sprawling six-person suite at Xavier University. Photo by Bob Driehaus. When she came to XU in 1987, many residence halls had no air conditioning and had one or two electrical outlets. Today's halls are air conditioned with individual thermostats and have strips of outlets to accommodate the flat-screen TVs, laptops, tablets, smart phones and other devices a student brings. The only subtraction are landlines, which are no longer available. Wi-Fi broadcasts in every corner of campus where students congregate, inside and out. Outside Fenwick, an inviting lawn is surrounding by benches with nearby outlets. It's a 21st Century hybrid of students staring at phones, but coming together in common spaces to do it. XU's campus living population has rocketed from fewer than 1,000 residents when Lambert arrived in 1987 to about 2,400 this year. Lambert points to statistics that show students who live on campus graduate at a higher rate than commuters and become more generous alumni contributors. 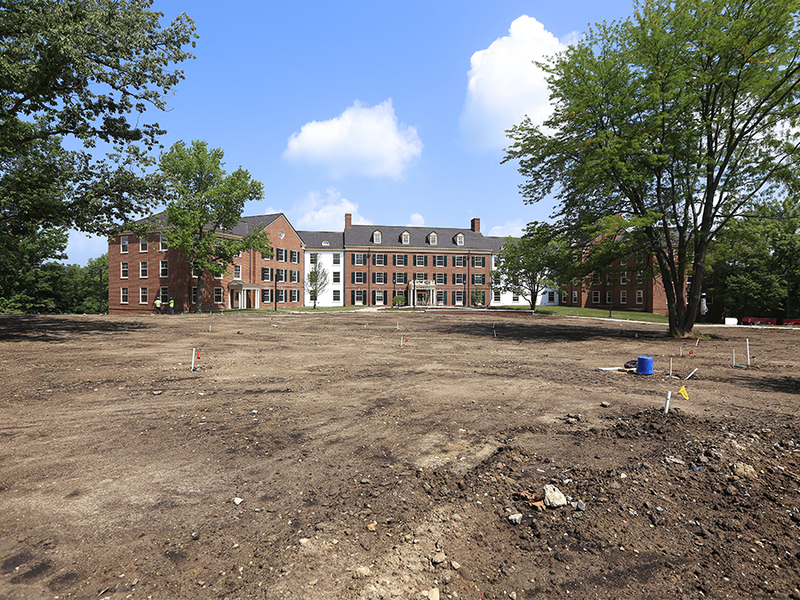 Miami University , with about 8,000 beds in residence halls and campus apartments, is in the midst of a 20-year upgrade of its housing that has added $450 million of debt to the books. Flower Hall is one of many that has been renovated in recent years, transformed into a modern residence hall with welcoming common areas, full kitchens and other modern amenities. Photo by Emily Maxwell | WCPO. For that hefty sum, students are coming home from class to bright, airy residence halls built or renovated to foster community through full kitchens, rec rooms and comfortable study spaces. Rooms are air conditioned with individual smart thermostats that automatically bump the temperature up in hot months or down in cold months when motion sensors detect that no one is in the room. They restore the desired temperature once someone returns. Built-in drawers and closet doors are gone, replaced by open niches with a single clothes bar, giving students flexibility. Desk chairs come apart so that the seat can be placed on the ground and used as a rocking video gaming chair. A laptop or game console can be placed on the chair base. The changes don't always cost money when it comes to daily expenses. Miami's new and renovated buildings consume less energy even with added air conditioning than old buildings that had no air thanks to the switch from steam heat to warm water heat and much better insulation. Portions of campus are now heated and cooled with the help of a massive geo-thermal system that runs at one-third the cost of conventional systems, according to David Creamer, Miami's treasurer. Miami's debt has grown significantly since the institution decided to upgrade residential and dining halls. In 2003, Miami had long-term debt of $227 million. That's grown to $600 million today. The current north quad renovations cost $98.3 million, including Miami issuing $95 million in bonds to pay for it. Creamer pointed out that level of debt is more than manageable for a university the size of Miami, which boasts an AA rating from Fitch and AA- from Moody's – both close to the highest possible rating of AAA. Creamer is circumspect about the cost as it relates to students and families contemplating whether to take out loans to pay for the experience of living on campus at Miami or another upgraded campus. "There are costs there. And students are spending more today than they did 40-50 years ago for certain services. It's a matter of choice," he said. "Some of the debt is too easily available to families and students. We do need to make sure that we're communicating to families. Many families are not choosing lower-cost pathways and they're doing that because of what they desire for their children and what they believe will grant the bigger value over a lifetime." The results of the upgrade are impressive. Miami responded to feedback from students and prospective students about their desire for nicer housing by launching a 20-year upgrade plan in 2010. "When we say renovation, the buildings are getting gutted down to the core," said Matt Frericks, who oversees the massive renovation and rebuilding effort going on with Miami's residence halls. A standard two-bed room at the renovated Brandon Hall is no bigger than it was a generation ago, but it's full of a lot more amenities and conveniences, like a smart thermostat that controls heat and air condition by room. Halls are no longer segregated by gender, with men and women living on the same floors though usually not in the same rooms. The exception to single-gender rooms comes with transgender students or other gender non-conforming students who agree to live in non-traditional arrangements. Frericks said having mixed-gender floors frees Miami to easily convert rooms from two women to two men or vice versa as needed rather than having to shift whole floors. Every floor in new and renovated halls has a men's room, a women's room, and a single stall, an all-gender bathroom and a shower. Miami is doing away with the "gang showers" with multiple shower heads in an open space and replacing them with private stalls that are divided by partitions and closed off by curtains. That's a reflection of changing levels of comfort among students who don't want to be seen showering by their floor mates, Frericks said. No new residential bathrooms have urinals so that they can be easily converted from male to female or vice versa. In Hepburn Hall, a previously narrow entrance was blown out to open into a sprawling kitchen with granite countertops, oven, microwave, refrigerator and sink with a tile backsplash. Suite-style bathrooms were shared by adjoining rooms were removed to create new bedrooms and replaced by community bathrooms at the end of the halls. Most colleges have stopped referring to housing as dormitories as a reflection of a very deliberate effort to make residence halls much more than a place to sleep between classes. Thomas More College has seen its residential population soar past capacity, with a waiting list of students hoping that a room opens up. Kevin Reynolds, assistant dean of student affairs, showed off more modest upgrades to the Crestvew Hills campus, including the 2001 addition of Murphy Hall. It features four- and six-student suites that are carpeted, drywalled and bursting with electrical outlets. A suite at Murphy Hall at Thomas More College. Photo by Bob Driehaus. Reynolds said Thomas More students come to campus with an average of five devices that use WiFi, so buildings have been outfitted with a lot of bandwidth. They've worked hard to improve the residential experience by doubling the number of Residential Assistants to help students navigate the college experience. "A dormitory is a place for sleeping. And it really goes way beyond that now," he said, with intentional community building. The college works to make students feel like part of a supportive community and to feel like they fit in. With those needs met, Reynolds said, students are poised to thrive academically and with extra curricular activities. XU's Commons Apartments, where President Michael Graham lives, feature housing for juniors and seniors who opt to stay on campus. Suites for three or four students include single bedrooms, a full kitchen and two bathrooms with showers. 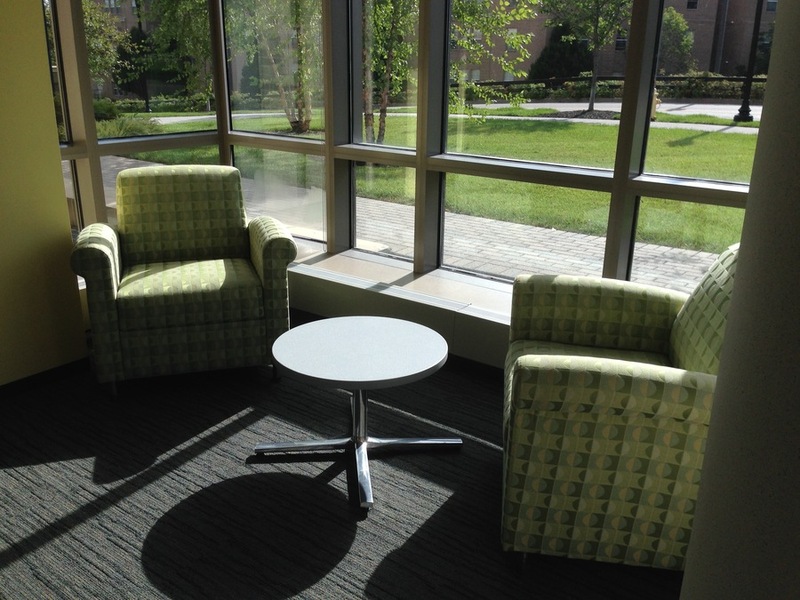 To combat students retreating into their suites without interacting with classmates, the hall features a two-story atrium with couches, chairs and a big TV to encourage socializing. At XU's Fenwick Hall, students have to take a one-floor elevator or stairwell and pass by the RA's desk and common area before moving onto elevators that take them to upper floors. "I won that battle," said Lambert said. Miami has transformed its first floors to promote interaction. "It's really about building community. We're really driving home that this is home," Frericks said. The old model of dorms being accessible by many doors has been replaced by central, locked entrances that force students to come in contact with each other and with Residential Assistants. In addition to being more safe to keep intruders out, it's a community-building strategy meant to prevent people from becoming isolated by slipping in and out of the buildings. 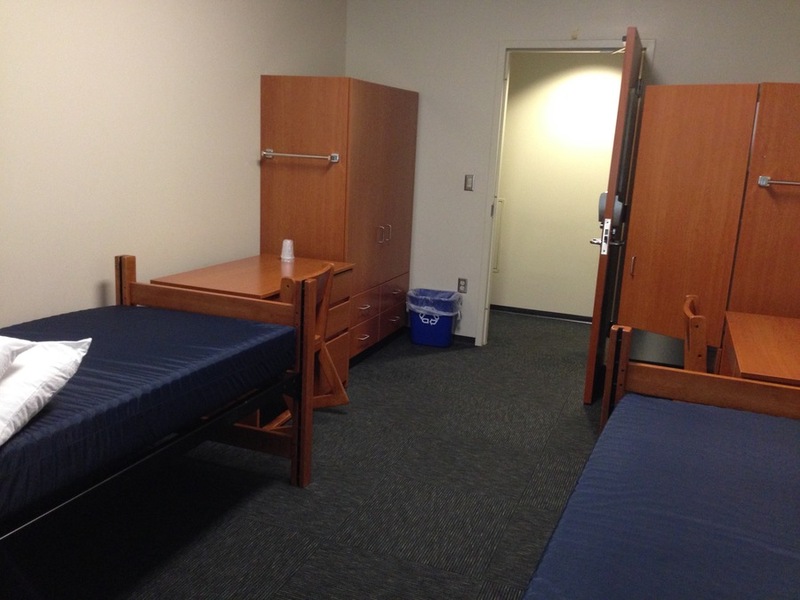 A common area in a Xavier residence hall. Photo by Bob Driehaus. Those side doors are still available as exits, but student key cards won't open them, and an alarm blares if the door is propped open for very long. The laundry rooms are transformed at Miami and XU. The days of students finding their clean or wet laundry dumped on the floor are over, or at least greatly reduced. That's because new machines are hooked to the internet, and students can check their phones to see if washers and dryers are open before they haul their laundry there and are tempted to empty their hallmate's undies onto the floor. And the smart machines text students to let them know the washer or dryer cycle is completed. Coins are history. Students swipe their student debit card/IDs to pay. New buildings at both universities are certified LEED Silver, meaning they've taken great steps to insulate them well, use efficient windows and lighting and taken other earth-friendly steps like installing bike racks and motion-sensitive lights and thermostats. It's all made for a great experience for Alyssa Hedric, a Miami student who spent her first two years in renovated residence halls. 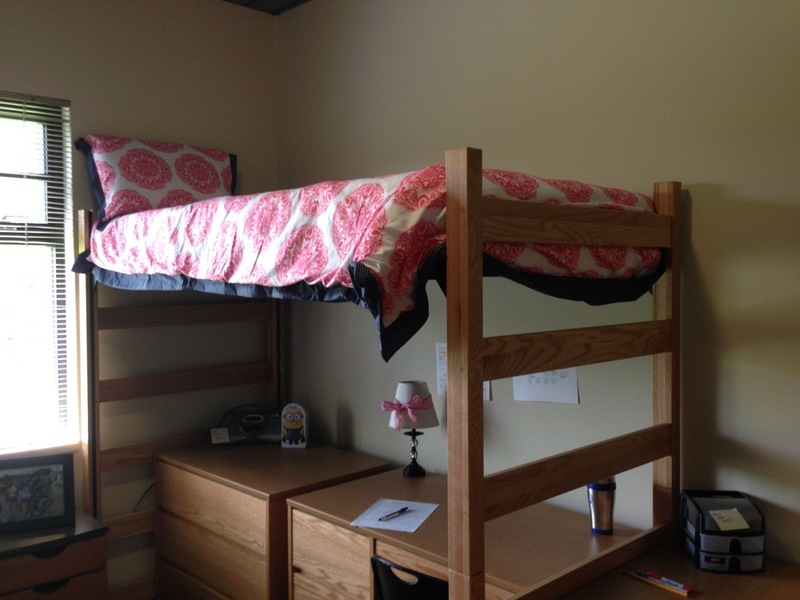 "Living in a dorm is awesome because you meet so many people, interact with them, help each to study," she said. "My first year, I lived in McFarland, which had just been renovated. It was like a brand new, super nice hotel." She studied often in the common areas or with teammates from Miami's softball team, which has a required amount of study time. "It was definitely different having to share a room and having a community bathroom, but I didn't mind it. I thought the room was pretty big," Hedric said. Her sophomore year, Hedric lived in the renovated Ogden Hall, which had the added bonus of sitting above a dining hall – "the best part," she said. Hedric and her roommate took some of the same classes and found themselves studying together often in their room. It's a far cry from the experience of her dad, Craig Hedric, a Butler County judge who graduated from Miami in 1983. He spent his freshman year in a triple-occupancy room, though he lucked out by having just one roommate. That left room for a bean bag chair and hallmates to come socialize. The gang shower was just fine – except when someone flushed the toilet without warning. "If you flushed a toilet, the other people got scalded. So the deal was that you had to yell, 'Flush!'" he said. Judge Hedric is glad his daughter has had better facilities, but he looks back on his experience fondly. "It was beautiful. I never had to cook a meal," he said.